We are a co-op loving bunch around these parts, and enjoy playing games to their fullest cooperative extent. That said, there's nothing wrong with a little friendly competition while playing co-op. During this week's Monday night stream, Locke, Nick, Mike, and Jason decided to see who made the most formidable SWAT duo in Door Kickers: Action Squad. I only ever played a little of the original Door Kickers, though I know both Nick and Locke really dug the top-down tactical action that it offered. 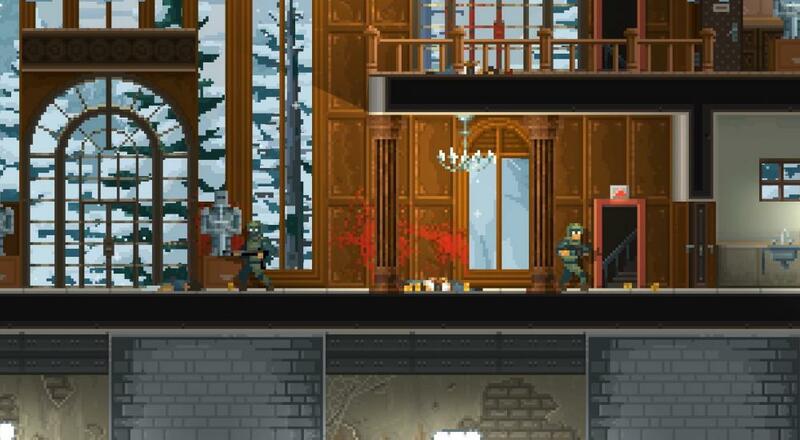 Changing the format to a side-scrolling action platformer left both of them wondering how tactical it would be, and we were all pleasantly surprised by what KillHouse has done with this follow-up. Each level presents players with a set objective (e.g., rescue all hostages, clear all hostiles, or defuse a bomb), and the way you go about achieving said objective is entirely up to you and your co-op buddy. For example, two enemies standing below two skylights presents a great chance for you and your buddy to do a quick little countdown and drop down on the baddies simultaneously. You could also drop down on your own (assuming you're playing as the "Shield" class) to attract their attention/fire, while your buddy drops down a little after behind them and takes them out. The way you go about doing all of this is entirely up to you and elements of the game reminded us of titles like Gunpoint, Ronin, and Hotline: Miami. The title is still in Early Access, but we're really liking what we see and have played thus far. There are 24 missions currently available across two chapters, as well as three different playable classes, but more of all of that is planned for the game's full release sometime next year. Two player co-op, either locally or online, is supported throughout. We'll be keeping an eye on this as it develops and look forward to seeing how it progresses! Page created in 1.0465 seconds.